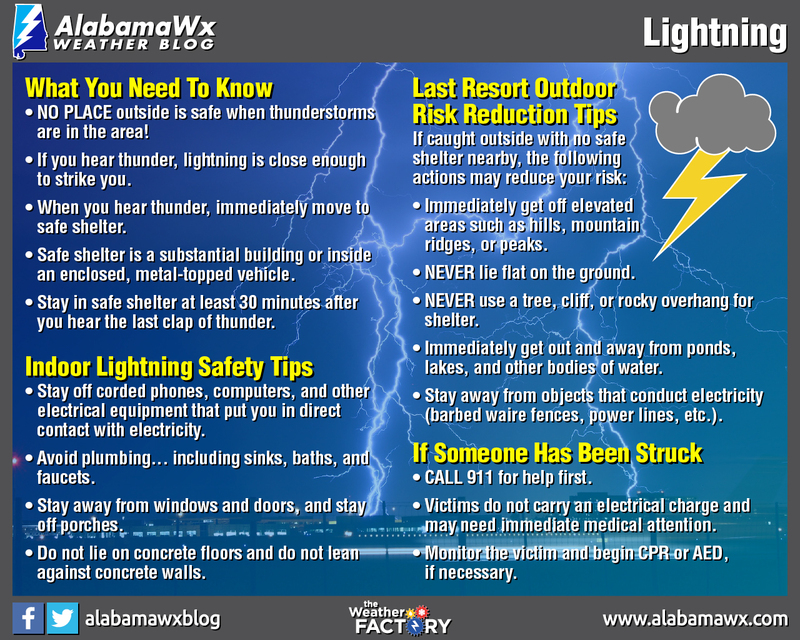 We are no strangers to lightning in Central Alabama, especially during the summer months with the daily pop-up thunderstorms we usually get. June, July, and August are the peak months for lightning in our area, but as you know, thunderstorms happen throughout the year. There are over 20 million cloud-to-ground lightning strikes in the United States each year, and each one of those strikes is a potential killer. Over 1,500 people have been killed in the United States over the past 30 years due to lightning… that’s an average of 51 people per year! During that same time frame, approximately 15,000 people have been injured by lightning. Some of these were left with life-long neurological damage. When thunder roars, go indoors! The main rule of thumb to remember with lightning, if you can hear thunder, you are close enough to be struck by lightning. A thunderstorm doesn’t have to be directly overhead for you to be in danger. Lightning can actually travel as far as 10 miles away or more from a thunderstorm. Use common sense when you plan on attending an outdoor event or activity. Check the forecast on the AlabamaWx Weather Blog and see what the weather has in store for the day. Be sure to check the sky to see if any storms are developing nearby. There are many weather apps out there that have live radar; download one and put it to use. The very second you hear thunder, you should head indoors, and do not use any electrical equipment. If you are out on the lake, get off the water as quickly as possible and get inside a well-constructed building or your vehicle with the windows rolled up. Tents, carports, sheds, and golf carts may give you a place to stay dry, but they do not give enough protection from lightning. If you’re caught outside in the open in a thunderstorm and you cannot find a building or vehicle, stay away from any isolated trees, and crouch down low to the ground, but do not lay flat. If you are caught in the woods, stay away from the tallest trees and find a small bunch of trees. While we are on the topic of lightning, let’s discuss heat lightning. For the 40 years (soon to be 41 years) I have been walking this earth, I have heard people talk about heat lightning. The saying is that heat lightning is caused by heat in the summertime air with no thunderstorm and causes no danger to people or property. The term is part of our culture here in Central Alabama, as well as in many parts of the country. The only problem is there is no such thing as heat lightning. All lightning, rather if it’s cloud to ground, cloud to cloud, and in cloud, must come from a thunderstorm. No thunderstorm, no lightning. In the summer, storms can climb to be higher than 50,000 feet in the sky, making the lightning visible as far as 100 miles away. At that distance, you can see the lightning, but can’t hear the thunder. James has a great post about heat lightning on the blog.